Battle Baptist Football Club is heading to Liverpool in search of a place in the final of a national knockout competition. The East Sussex League Premier Division leaders are away to Bankhall Mission in the semi-finals of the National Christian Cup tomorrow (Saturday). Battle manager Kyle Mann said: “This weekend is massive, not only for the players and the management, but the church and town of Battle. We have worked so hard to be in this position and will give it everything we can. “The game is going to be tough and physical. Lots of the players have played against sides from Liverpool over the last few seasons in the same competition, and I have been told to expect a tough battle and that they will be technically very good. Battle have won three matches to reach the semi-finals, beating St Mary’s West Croydon 3-2, Newgen (Kent) 4-1 and St Teresa’s Norris Green (Liverpool) 4-2. Bank Hall Mission have also come through three rounds and have been even more prolific in front of goal, winning 4-0, 5-4 and 5-1. At stake for the winners is a final showdown against the winners of the all-Liverpool semi-final between Bethel Church and St Sebastians. Battle, who won the competition two years ago, will drive up to Crewe this afternoon before heading on to Liverpool tomorrow morning in time for a 2pm kick-off. As far as the league is concerned, Battle lead a trio of teams level on points at the top of the table with two matches to go. 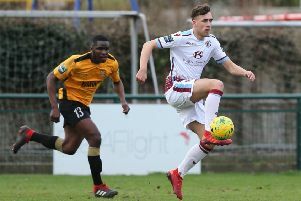 Battle’s remaining games are away to fourth-placed Sedlescombe Rangers on Saturday April 6 and at home to fifth-placed Robertsbridge United on Saturday April 27. Battle’s second team, meanwhile, suffered its first East Sussex League Division Two defeat of the season with a 2-0 loss away to Rock-a-Nore last weekend. The Baptists are two points behind leaders St Leonards Social II, who have already completed their programme, with two games to go. Fourth-placed Rock-a-Nore are five points behind second-placed Battle having played two fewer matches.